Israel Adesanya Wins Kelvin Gastelum, One Of The Greatest Matches, Five Rounds Of Total War!!! UFC 236 PPV (pay-per-view) event is happening live from inside State Farm Arena in Atlanta, Georgia tonight (Saturday, April 13, 2019). The co-main event of the evening brings an interesting Interim Middleweight title match between the ex-AFC 185-pound champ Israel Adesanya and TUF 17 winner Kelvin Gastelum. Marc Goddard is our referee. The fight kicks off! Adesanya has a huge reach and height advantage. Fighters don’t touch gloves. Adesanya feints at the beginning of the fight. Adesanya switches stances and delivers a good front kick to the body. Low kick Adesanya, Gastelum returns. What a brutal middle kick!!! Gastelum chases Israel but misses. Adesanya moves around. Israel misses with a middle kick, Gastelum delivers a good left kick to the body. Gastelum misses with his left hand over and over. Middle kick Adesanya just missed. Wow, this left punch was big, dangerous left hook, Adesanya eats shot, ends up on his back, but gets up and escapes. Body shot Gastelum. Adesanya was rocked but survived!!! Great right hook Gastelum, Kelvin grabs his leg and counters with a big punch. Wow, Israel evades all the strikes, and counters with a low kick. Gastelum is missing a lot at the moment. 1-2 combo Gastelum missed by a hair. Another big punch. Question mark kick by Adesanya but ends up in the guard. Good body kick by Israel. Adesanya missed with a right hand, great slip. Superman punch attempt Adesanya, but Gastelum moves his head well. Gastelum misses with a strong punch. I’d say, 10-9 Gastelum. Adesanya seems nervous. Middle kick just missed. Low kick Adesanya. Left hook Adesanya, but it is too weak. Gastelum moves forward, eats a low kick. Body punch Kelvin. Adesanya feints, Gastelum delivers a big left hand. Again Gastelum misses by a hair but delivers a punch to the body. Israel looks better in this round. Gastelum lands a big left through Israel’s guard. High kick attempt Adesanya, blocked. 1-2 Gastelum. Left hand Gastelum, it touched his chin. Awesome hooks by Gastelum, who eats a low kick. It is still a tactical war. Big left hand, Gastelum. Right hook Adesanya. Gastelum moves his head and counters with a body punch. Wow, what a right-hand counter, Gastelum ends up on his back!!! But he gets up, Adesanya lets him! Low kick Adesanya. Gastelum misses by a hair again. It turns into a wild brawl! Adesanya misses with a left hook but delivers a big high kick! Adesanya evades well. Low kick Adesanya, followed by a strong right hand. Gastelum tries to hit with a punch, wow what a right spinning back elbow this was!!! Gastelum went down, but he survives and gets up, what is this guy made of? Great kick Adesanya, fighters trading shots. Gastelum tries to shoot in, but Israel sprawls and defends. The end of the round, 10-9 Adesanya. Gastelum’s corner orders him to change tactics, he is advised to go in and out all the time. Gastelum moves back. Middle kick just missed. Great low kick. Right hand Adesanya. Gastelum circles around and delivers a body punch. Fighters clinched up, Adesanya misses with a right knee to the head and separates. Front punch Gastelum. Body kick Israel, Kelvin nearly caught his leg. High kick Adesanya. Kelvin goes forward, question mark kick just missed by Adesanya, followed by a low kick. Low kick Kelvin. Adesanya goes for a right high kick, blocked. Good low kick, but Gastelum eats punches to the head. Wow, big right-hand counter Adesanya, Kelvin grabs his waist and defends. Fighters separate, and now trading shots. Big left hand, Gastelum. Superb combo Adesanya. Middle kick to the body. Low kick. 90 seconds left in this round. Awesome takedown by Gastelum, he was able to evade the strike. Adesanya gets up, is this guy a magician?! Superb defense. Gastelum delivers good jab. Big left hand Israel. High kick Adesanya, it seems Gastelum can’t move well at the moment. Low kick Adesanya, who tries Superman punch off the cage. The end of the round, I think 10-9 Adesanya. Gastelum gets advice to land cleaner shots. Gastelum misses with a combo, missed by a hair, low kick Israel, Kelvin attacks all the time, goes in for the kill. He misses, but clinches up with Adesanya, he has double under-hook, but Adesanya evades. Superb strikes on both sides. Left hand Kelvin, low kick Israel. Wow, what a great strike by Israel, it was an elite level Muay Thai technique. The referee warns fighters for opened fingers. Again great right hand. Gastelum clinches up, Israel escapes. 1-2 combo Kelvin misses by a hair. 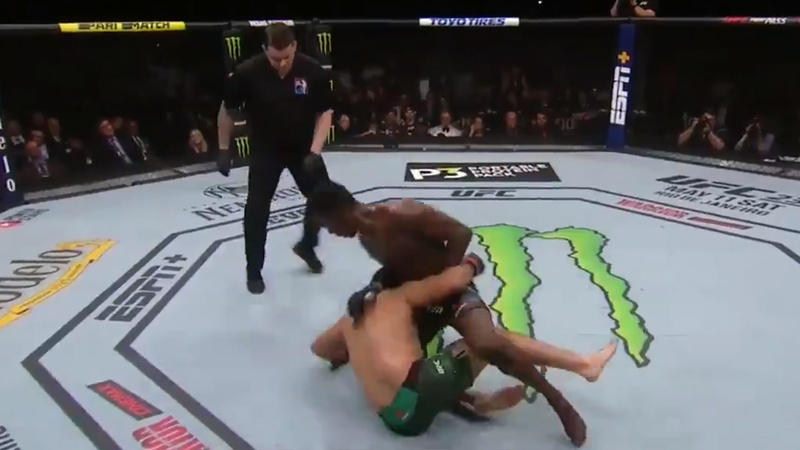 Wow, this left hand was big, Adesanya circles. Awesome strikes by Gastelum, but Israel ducks under. Adesanya is pressed against the cage, but Israel evades the clinch easily. Wow, is this Adesanya bleeding?! I think yes! Great quick punches to the head Gastelum. Wow, those are superb shots to the head, amazing boxing match!!! What a fight, there was at least 5 strong strikes on both sides!!! Low kick Adesanya. Left hand to the chin Gastelum. Adesanya circles and defends left hand to the face well. Body shot Gastelum. Low kick Israel. Wow, what a left high kick, Gastelum rocked him hard, it seems Gastelum continues to rain punches. What a mistake by Gastelum, why did he go for a takedown?!!! He could have finished the fight with punches, Adesanya was wobbled! Adesanya was in big trouble but delivers a big kick to the head. Great punches on both sides, Adesanya is pressed against the cage. The end of the round, 10-9 Gastelum. Wow, Kelvin goes forward, superb fight. Gastelum delivers big right hand. Good punches followed by a low kick, Adesanya pulls back. Low kick Israel. Body punch Kelvin. Israel delivers a huge punch. Wow, this left hand landed, Adesanya escapes but he looks bad. Strong low kick Kelvin. Big right hand Israel, awesome low kick. Adesanya went for a guillotine, he falls down, Gastelum countered him well, is this a triangle choke attempt? Yes, but Gastelum escapes, both fighters are back on their feet. What a wild brawl, 4 or 5 strikes. An outstanding fight, this is a superb clash!! Good right hand Israel, Gastelum misses with a left hand. Big punches on both sides. Middle kick Adesanya. What are these guys made of? Gastelum goes for a takedown but forfeits. Awesome strikes on both sides. Big right hand Israel Adesanya!!! Low kick Gastelum. Wow, Gastelum goes down after a strong punch, Gastelum grabbed his leg and stood up. Kelvin is trying to take him down, but Israel escapes. Wow, what an elbow, it seems Kelvin is bleeding!!! Gastelum is on the floor again, Jason Herzog is not stopping the fight. Kelvin Gastelum’s face was covered in blood, big punches Israel, and the fight is over. We’ll see judges’ scorecards. I am unsure who won this round, maybe 10-9 Israel. Israel Adesanya improves the score to 17-0 MMA, 6-0 UFC, Kelvin Gastelum drops to 15-4, 1 NC MMA, 10-4, 1 NC UFC. What a finish by Adesanya!!!!!!!! What a fight!!! Adesanya took that fight. Mock Goddard again questionable. That fight could be have been stopped. What a fight that was! Omg m!!! @ufc was that a 10-8 in the 5th to close it out?! Wow!!!!! Best @ufc fight I’ve ever seen!! !